Unleash your inner inventor. Build and play with circuits to creating your own electronic inventions. 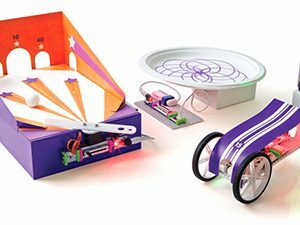 Motors, wheels, lights, switches, servos, buzzers, etc are snapped together to invent a remote control racecar, build an automatic bubble blowing device, make a bumper ball game and more. In the midst of creating all the exciting electronic gizmos, student will learn about the electronics components, circuit diagrams, symbols, connections and polarities.